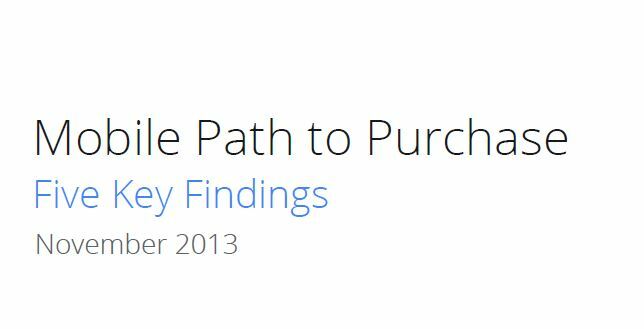 A recent study by Google and Nielsen showed how mobile purchasers search for and access information, then make purchases quickly. 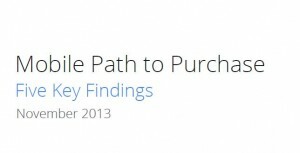 The study was published in Nov 2013 and is entitled “Mobile Path to Purchase: Five Key Findings.” We are going to emphasize two of the five points from the report in this article. One of the key implications of the report is for advertisers: “… consumers visit business websites on their phones an average of 6 times in their purchase process.” Having a mobile-friendly site for potential customers is a key to getting these sales. If you don’t have one, they will find a competitor who does. Another key implication is immediacy: “more than half (55%)of mobile consumers want to complete the purchase within the hour, and 83% want to purchase within a day.” You need to make it easy for customers to contact you and start that transaction with “click to call” or provide them with mobile checkout capability so they can buy it without speaking to you. Both of these findings reinforce the fact that if you don’t have a mobile-friendly web site now, you need to get one quickly! it doesn’t matter what you are selling, products or services, if you want to attract new clients, one of the best and most efficient tools is a great mobile experience for all those mobile internet users. Give us a call today and let us help you go mobile! This entry was posted	on Thursday, December 26th, 2013 at 7:37 pm	and is filed under Mobile Browsing, Web. You can follow any responses to this entry through the RSS 2.0 feed. Both comments and pings are currently closed.